I intend to add to this page other resources regarding common phrases, grammar, writing, etc., as an easy reference for you. For now, I hope you enjoy this new "Common Errors" page. Why the King James for Homeschoolers? Remember what you're doing and why. it's a long, long marathon. and go easy on the runners. Why Homeschool? Read some articles about the agenda of US government schools and you'll better understand why you ought to homeschool your children. Is NEA a "Terrorist Organization?" we wouldn't get anything done at all!! It's a secular book with lots of good ideas. Is "higher" education absolutely necessary? "And even though teachers and educators have noble intentions, their position in our economy, by design is dependent upon a psychology of the scarcity of knowledge." What do you think of this quote from the above site? Suggesting this site to you is in no way an implication that a college or university education is unnecessary... just something to ponder. The children have more time: to read (aloud and silently); to learn responsibility by doing chores at home; to play (without adult direction) and use the imagination; to listen to and enjoy each other; to learn obedience. Parents need not deprogram or reteach values the child hears for seven hours a day. They have the child's full attention at any time of the day and can give him full attention; he is not absorbing two different value systems daily. Children learn to love each other more. They do not look down on one another in favor of their peers, or in wrong adulation of older children. This society teaches that among children "older is better." That's not right. Having them at home all day allows them to be children without having to "grow up" in the wrong ways. They learn to be servants of one another. The family is a microcosm of the Body of Christ. After I asked Val to write this I had the fun of trying it out myself. Val and Walt went to South Carolina (taking their nursing baby Colleen) and I had the other four for five (very busy!) days. There was a schedule of chores posted in the kitchen. Daily I reminded them (seldom more than once). The nine-, seven-, and five-year-olds took turns setting and clearing the table, emptying the dishwasher, folding laundry, sweeping the kitchen. Walter (the oldest) and Jim (not quite three} took out trash, the girls cleaned the bathroom. All but Jim made their beds. School began at nine with Bible reading, singing, prayer, all four joining in. Jim sat on the floor and played while the others studied. Christiana finished her kindergarten work by ten or so, Walter and Elisabeth worked till nearly lunchtime. Every afternoon there was Quiet Hour. This was a lifesaver for Granny. The three older children were expected to be in their rooms for an hour. They did not need to sleep, but they were to read or find something quiet to do alone. (Not once did we have any altercation about Quiet Hour. It had always been a part of their lives, and they liked it.) Jim and I lay down together, I read him a Beatrix Potter story, and he fell asleep. Since we had no car, four of us walked to the grocery store every day, while Walter rode his bike. It was an interesting string of people, Elisabeth hugging (for example) five pounds of flour, Christiana batting things with a box of Saran Wrap, Jim lugging a bag of apples, Granny with a loaded brown bag. We had poetry readings (Jim memorized with no effort at all) and singing. Everybody learned "Chattanooga Choo-Choo," by mistake, as it were--I meant for them to learn "Praise the Savior" but somehow that one didn't stick so easily, alas! Walter and Elisabeth practiced the piano and played vigorous duets for the rest of us. We made bread and organized drawers and closets and sorted clothes and toys for give-away and picked violets and had a marvelous time. I should confess this--on the evening of the first day I wasn't sure I'd survive the week. When Val phoned I asked, "How do you do it?" "Mama, I just do what you taught me: don't think about all you have to do, just do the next thing!" I needed to be told what I have often told others, and it worked. 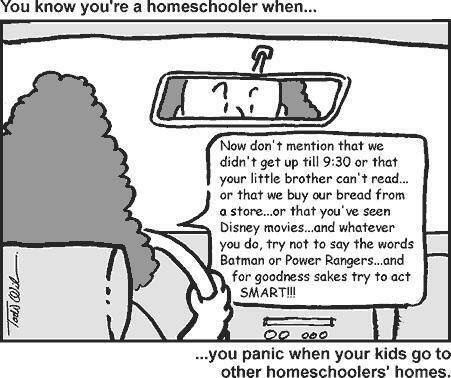 Homeschooling is demanding to say the least--but worthwhile. If you are considering trying it, you might want to get Mary Pride's The Big Book of Home Learning: The Complete Guide to Everything Educational for You and Your Child (Crossways). HOME SCHOOL DIGEST will strengthen, encourage and equip you in your journey of homeschooling, raising Godly children, and walking closer with Jesus Christ. Explore the Human Body --- A family SAFE place to see and learn about the human body and its function. Take a test of your understanding of different functions of the human body. No reproductive or se*ual content. This page has info and links for making little books for projects, unit studies and more! featuring fun coloring page images. These are suitable for preschool, kindergarten and early elementary. The Great Patriotism Information Page! about writing, grammar & punctuation. When were states admitted to the Union? What are some key facts about each state? Do you want to read a "mini history" of each state? Click on the state name to find out!! "The probability of life originating from an accident is comparable to the probability of an unabridged dictionary resulting from an explosion in a print shop." More Neat Stuff For You! Begin filling a "Hope Chest"
You can read about the inspiring life of the author of the book, The Hope Chest: A Legacy of Love, about hope chests and traditions, and gather ideas and patterns for learning and preparing for your Hope Chest. Many things have been added to this site. all about pens, & dipping ink, about the art of writing and more. This book is a *must-read* for families. TEACHER: No, Ellen..... Always say, "I am."